This is a Pre-Recorded Webinar available for viewing on your own schedule. We’ll email you instructions for viewing the same day we receive order notification. Projects are delivered by people, not processes, systems, or applications. In the end, a Project Manager cannot be successful without a well-organized and skilled set of team members. At the same time, it certainly doesn’t hurt to have a good set of tools when leading the project! In “The Project Leader’s Toolbox, Vol. 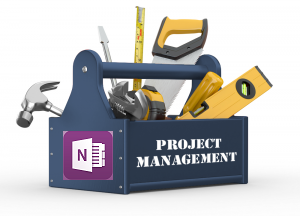 1: Using OneNote in the Project Environment,” participants will discover how to effectively use Microsoft’s OneNote program while managing their projects. Although OneNote is often viewed (improperly) as a simple note-taking program, it is feature-rich and can be an effective alternative (or complement) to more traditional project management software applications. The facilitator will share and illustrate some helpful tips and tricks that can be used by anyone managing a project. This session will be facilitated by Michael (Mike) Portera, PMP®. To learn more about Mike, check out his bio here. All Project Leadership SeriesSM instructors are certified Project Management Professionals (PMP)® with many years of hands-on project leadership experience in a multitude of industries.